American Grace is a major achievement, a groundbreaking examination of religion in America. Unique among nations, America is deeply religious, religiously diverse, and remarkably tolerant. But in recent decades the nation's religious landscape has been reshaped. America has experienced three seismic shocks, say Robert Putnam and David Campbell. In the 1960s, religious observance plummeted. Then in the 1970s and 1980s, a conservative reaction produced the rise of evangelicalism and the Religious Right. Since the 1990s, however, young people, turned off by that linkage between faith and conservative politics, have abandoned organized religion. The result has been a growing polarization--the ranks of religious conservatives and secular liberals have swelled, leaving a dwindling group of religious moderates in between. At the same time, personal interfaith ties are strengthening. Interfaith marriage has increased while religious identities have become more fluid. Putnam and Campbell show how this denser web of personal ties brings surprising interfaith tolerance, notwithstanding the so-called culture wars. - Jews are the most broadly popular religious group in America today. 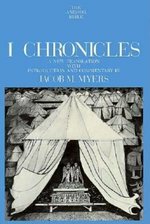 "I Chronicles" (Volume 12 in the acclaimed Anchor Bible series) is a book closely related to three other books of the so-called Chronicler's History-- "II Chronicles," "Ezra," and "Nehemiah." "I Chronicles" begins with the famous genealogical lists (from Adam to David), continues with an account of David's reign, in which the chronicler emphasizes David's efforts to restore the religion of Israel, and concludes with the accession of Solomon to the throne of Judah. A crucial book for historians of the biblical period and for students of the Bible, "I Chronicles" is to be neither accepted as a faithful narrative of the Davidic period nor dismissed as a fanciful, imaginative re-creation of that history. It must be taken as an important clue to the biblical process. For here we find the Bible quoting itself--sometimes directly, sometimes in paraphrase. Professor Myers meticulously analyzes important aspects of the Chronicler and his work--his method of composition, his conviction that to rebuild the nation of Israel one had to restore and strengthen her traditional religion, his significantly post-Exilic perspective. The book also examines the vast literature on Chronicles to find what it yields toward a better understanding of the Chronicler and a fuller appreciation of his work. Finally, it compares--in exhaustive detail-- "I Chronicles" with the other books in the Bible to which it is parallel. The volume Professor Myers has produced is no less than a definitive treatment of the subject. 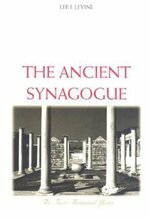 A history of the synagogue from the Hellenistic period to the end of late antiquity. It traces its development from a communal institution to one which had a distinctively religious profile, describing its basic features, the roles of its rabbis and priests, its liturgy, and its art. 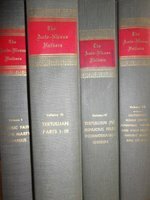 Quintus Septimius Florens Tertullianus, anglicised as Tertullian, (ca. 160 – ca. 220 A.D.) was a prolific early Christian Berber author and the first to produce an extensive corpus of Latin Christian literature. He also was a notable early Christian apologist and a polemicist against heresy. Tertullian has been called "the father of Latin Christianity". Though conservative, he did originate and advance new theology to the early Church. He is perhaps most famous for being the oldest extant Latin writer to use the term Trinity (Latin trinitas),  and giving the oldest extant formal exposition of a Trinitarian theology.. Other Latin formulations that first appear in his work are "three Persons, one Substance" as the Latin "tres Personae, una Substantia" (itself from the Koine Greek "treis Hypostases, Homoousios"). Some of Tertullian's ideas were not acceptable to the orthodox Church; in later life he became a Montanist. 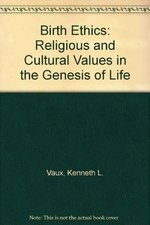 In the second volume of the Challenges in Ethics series, Kenneth L. Vaux examines the characteristics of the human quest for life and health. He than traces three roots of technological consciousness: the Hebrew understanding of time enables an understanding of progress and technologicall acceleration; the Greek view of nature shows the parameters of technological possibility; and the Christian grasp of the future offers symbols of desired utopia. With such tools in hand, the reader is invited into conversation. Designed for adult, Being Well offers several case studies for discussion, primarity borderline cases that are likely to result in informed debate. Guidelines for group use are included. Hour-long sessions for 6-8 weeks. Much of the writing in Anglo-American epistemology in the twentieth century focused on the conditions for beliefs being "justified." In a book that seeks to shift the ground of debate within theory of knowledge, William P. Alston finds that the century-long search for a correct account of the nature and conditions of epistemic justification misses the point. Alston calls for that search to be suspended and for talk of epistemic justification to cease. He proposes instead an approach to the epistemology of belief that focuses on the evaluation of various "epistemic desiderata" that may be satisfied by beliefs.Alston finds that features of belief that are desirable for the goals of cognition include having an adequate basis, being formed in a reliable way, and coherence within bodies of belief. In Alston's view, a belief's being based on an adequate ground and its being formed in a reliable way, though often treated as competing accounts of justification, are virtually identical. 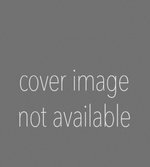 Beyond "Justification" also contains discussions of fundamental questions about the epistemic status of principles and beliefs and appropriate responses to various kinds of skepticism. Discusses human sexuality, population contral, women's rights, genetic research, abortion, AIDS, and childcare. This book portrays the historical development of the Pentecostal church since its beginnings amongst the Black Christians of America who spoke out against the inequalities and divisions of racist America. The author goes on to explain the root cause for the division between black and white churches in general and black and white Pentecostal churches in particular. Whilst he puts the Black Pentecostal Church in the UK in its historical perspective, he also reveals how the division that exists is similar to the tension which is seen between black and white Christians in main line Christian churches. 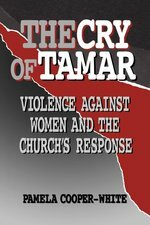 The author shows that there is an alternative to the way we deal with the race problem and that is seen in the early Pentecostal church. 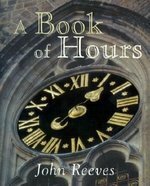 Written in the tradition of the exquisite prayer books of the medieval period, this modern book of hours offers you a unique devotional experience with beautiful poems for meditation on Christ and the Christian life. 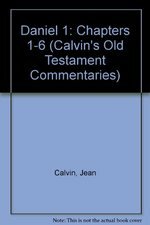 This volume faithfully reproduces Calvin's definitive lectures on the first twelve chapters of Ezekiel. This commentary contains an exposition of God's prophetic word, and the prayers that follow each chapter deserve special attention both as superb spiritual models and as valuable glimples into Calvin's inner life. "The motive in writing this book is the hope of sharing a perspective of divorce that is all too often overlooked or ignored. It is difficult to realize that divorce leaves victims other than the ex-spouse. The children of divorce are also victims. They are victims of change where they had no choices; victims where the important players in their lives are torn from the careful scripting of the American idea of family." --from the Introduction Both a parish minister and a child of divorced parents, Adams contributes a pastoral care book to help ministers understand the necessity and benefits of counseling the child or adolescent of a divorcing family. Christian Dogmatics is a two-volume survey of the twelve major loci of Christian doctrine, each treated extensively in terms of its biblical foundations, historical tradition, and contemporary significance. From the perspective of the Lutheran tradition and in view of the unique questions and issues of the American context, each locus is developed independent of the others by six theologians, themselves influenced by divergent theological movements: Carl Braaten, Gerhard Forde, Philip Hefner, Robert Jenson, Paul Sponheim, and Hans Schwartz. Volume 1 discusses dogmatics, the Trinity, the identity of God, creation, sin, and Christology. Volume 2 treats atonement, the Holy Spirit, ecclesiology, the sacraments, justification by faith, and eschatology. Understanding the interaction between faith and culture has become an issue of increasing importance in recent years. In this book, Michael Paul Gallagher brings together a wide area of reflection on the relationship between faith and the cultural contexts influencing believers today. Gallagher begins his treatment with a look at how "culture" has been defined by theorists and how those meanings have shifted over time. The author then moves to specifically religious responses to culture, focusing on Vatican II and reflections from the World Council of Churches. Next, themes concerning modernity and postmodernity are explored in detail. The positive side of postmodernity - its sense of openness and possibility, its stress on community and connectedness - opens up new vistas for faith and culture, and in this light, the author discusses more pastoral issues such as inculturation, evangelization, youth ministry and spirituality. While Gallagher draws on the work of leading thinkers in the field, Clashing Symbols is not just for the academic or specialist. How does race shape people? Our society is not a harmonious blend of contrasting themes but is fast becoming an enduring culture of opposition. Race and ethnicity are the most frequent topics in our national dialogue. President Clinton has appointed a panel to discuss race matters across the country. But where does the Christian church stand? How can one of the most segregated institutions in North America help to reconcile the sins of racism, bigotry, and prejudice? The Color of Faith seeks to answer these questions. Fumitaka Matsuoka provides a theological perspective on racial and ethnic plurality that contributes to the discussion on forging a new vision of relatedness and community building across racial divides -- with his sharpest focus on the theological perspective on racial and ethnic plurality, alienation across shifting race lines, and race and justice. God's call to salvation is a call to a conversion from one way of life to another. 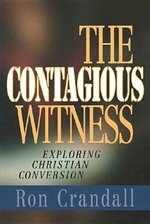 Christians know that they are called to participate in the conversion of others by bearing witness to the salvation they have experienced in Christ. Yet most, uncertain of how they will be perceived and of the appropriate times and circumstances in which to share the gospel, are intimidated by the biblical mandate to witness to others. Through extensive interviews, Ronald Crandall and his associates have asked a basic question of thousands of Christians: How did you come to believe? The answers they have found provide important, practical guidelines for pastors and all those who seek to help others learn to engage in personal witness. The author analyzes the theology and function of the three divisions of the Hebrew Bible: Torah, Prophets, and Writings. 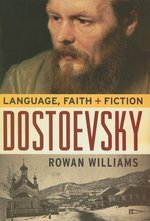 Rowan Williams explores the beauty and intricacies of speech, fiction, metaphor, and iconography in the works of Dostoevsky, one of literature's most complex, and most misunderstood, authors. 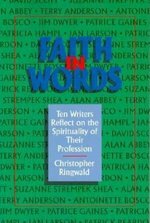 Highly respected wordsmiths -- including Terry Anderson, the journalist held hostage in Lebanon -- reflect on faith and writing.